Melbourne - Deluge of solar projects, wind farms vie for hook-ups. Grid congestion, instability slow connection approvals. Melbourne - Australia’s wind and solar boom looks set to power through 2019 following a record year, despite grid constraints and extra scrutiny from network operators to make sure new projects don’t spark blackouts like ones that hit two years ago. Abundant wind and sun, falling turbine and panel costs, and corporate demand for contracts to hedge against rising power tariffs have attracted dozens of international developers looking to build wind and solar farms Down Under. Even though the developers have met with flip-flops on energy policy, a strained grid that has trouble integrating intermittent renewable power, and unexpected hook-up costs, they still see Australia as a growth market. “We believe that we have a great future in Australia, because we have the right answers,” said Xavier Barbaro, Chief Executive of France’s Neoen, whose biggest market is Australia. Companies like Neoen, its compatriot Total-Eren, India’s Adani, U.S. utility AES Corp and Germany’s Sonnen are expanding in Australia, looking to fill a gap as ageing coal-fired plants are retired over the next two decades. “Confidence is high as the industry enters 2019, with unprecedented levels of construction activity under way,” said Anna Freeman, a director at the Clean Energy Council, an industry group. Australia generates nearly 20 percent of its electricity from renewables. This is forecast to jump to 75 percent over the next 20 years. A total of 14.7 gigawatts (GW) of large-scale solar and wind projects worth A$20 billion ($14 billion) were under construction or reached financial close last year, more than double 2017’s record, according to the Clean Energy Council. This rush of projects, with no clear guidance on where they best fit, led to an “element of anarchy”, but that is changing, said Simon Currie, founder of advisory firm Energy Estate. The Australian Energy Market Operator (AEMO), the energy council and network companies are working out clear guidelines on where to build plants and how to connect them to the grid. “We’re moving from what was an opportunistic-based approach ... into something that will be much more planned,” said Currie, whose company wants to develop Australia’s biggest renewable energy hub, with 4 GW of wind, solar and pumped hydro capacity in New South Wales. Renewable projects added to the grid have grown from 22 with 1.2 GW of capacity in 2013 to a record 45 projects with 2.9 GW added in 2018, AEMO said. There are 114 more applications representing 15.9 GW pending, indicating plenty of potential congestion ahead. 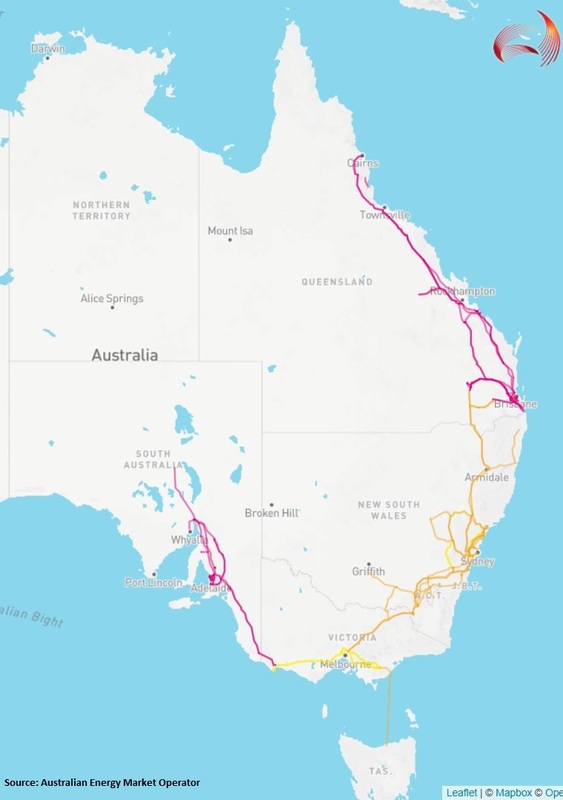 The biggest challenge is that developers are all vying to connect to a grid running 5,000 km (3,100 miles) from Queensland in the north to South Australia and Tasmania. This grid was designed to deliver power mainly from always-on coal-fired plants near three big mining areas, while wind and solar farms generate intermittent power from more remote sites, where network capacity can be limited. To keep the grid stable, equipment such as “synchronous condensers” or batteries need to be added, which can increase costs by at least $20 million for a condenser alone. Batteries could be much higher. Developers who failed to account for these issues have run into delays on project approvals or grid hook-up, bringing unanticipated costs, which in one case, led to the collapse of engineering firm RCR Tomlinson last November. A Clean Energy Council survey of senior executives in December found grid connection is the biggest industry concern heading into 2019, Freeman said. UK-based solar investor Octopus Investments said grid issues were what took it two years to choose its first investment in Australia. The Darlington Point solar farm is about to begin construction and will be the country’s largest. “The grid is the biggest issue where assets fail in our project filter,” Octopus Managing Director Sam Reynolds told Reuters, declining to name projects the company rejected. Developers and project lenders said they need to consider grid congestion, which can curtail power that gets to the network from any one plant; intermittency of wind and solar power, which affects current flow; and transmission losses, called marginal loss factors (MLFs). “There’s a bit of nervousness around MLFs, curtailment, and then there’s construction and commissioning risk,” said Stephen Panizza, head of renewable energy at Federation Asset Management. MLFs measure energy lost over power networks and have been increasing, with renewable projects being on the outer reaches of the grid, weakening returns for some operators. Another factor is the cost of the extra technology to keep current steady on the grid as more intermittent power is added. In November, France’s Total-Eren agreed to buy a synchronous condenser to secure a connection agreement so it could build the A$330 million Kiamal solar farm in Victoria. Delays due to talks with AEMO about the condenser, however, led to Total-Eren losing one of its power purchase agreements (PPAs). Total-Eren’s Asia Pacific director, Michael Vawser, says other projects will face the same trouble. “I do think there are other projects ... caught off-guard by new grid regulations that will lose their PPAs through delays in being allowed to connect to the grid,” Vawser told Reuters in an interview in November. Neoen, which has built 1 GW of wind and solar farms and the world’s biggest battery in Australia over the past four years, said in a recent prospectus it had collected 14 million euros ($16 million) in damages from a contractor building three solar farms because of hook-up delays. Despite the challenges, Neoen, Total-Eren and their rivals are still scouring Australia for more opportunities. “Australia is still an attractive market for us,” Vawser said.